Looking at Chobham Common, be it walking, with dogs or horse riding, the vegetation is the obvious scenery on the Common. Naturally, Surrey Wildlife Trust – through Rangers and volunteers – is conserving the landscape in to its natural, heathland ecology. But what of the terrain itself? Man has had a major impact, whether we are able to see it today or not, on the landscape of Chobham Common and its history. Obvious features can be traced to pre-history – barrows , etc – and medieval times – enclosures (eg , ), Bee Garden , Fishpool , Glover’s Pond, and Gracious Pond, before it was drained (but still leaves an significant feature on the landscape). However, there are four more recent events which have shaped how we see Chobham Common today; figure 1 plots some of the events. The Sappers had a number of tasks including setting out the boundaries of the regiments in the Camp on a large-scale plan “…Corporal Sinnett [*]drew the 12-inch plan furnished for the use of Colonel Vicars [**]…”. The whole area was also surveyed and drawn at 2 inches to a mile, and Aldershot Heath surveyed and plotted at 6 inches to a mile. It is likely that Figure 4, dated 1855, was based on the former ***. *** British Library reference Maps 2560.(24.). The History records that the field works were completed in early August. The Spectator recorded that on “…Wednesday the Sappers began to throw up a redoubt with entrenchments on the Windsor road; which were partially used next day, when the Queen was present” . Queen Victoria (on occasion with Prince Albert) visited the Camp on 21 June , 5 July, 4 August and 6 August 1853. Unfortunately for the latter visit the plans to explode the mines planted on Sheep’s-hill failed using charge from voltaic batteries, instead they were detonated “…the ordinary way the powder-hose to form the train…” . Although it is not recorded who constructed them, shallow ponds were prepared in the peaty soil of the Common for watering the cavalry horses . …large quantities of provisions were stored there, including 30 hogsheads (barrels) each containing 56 gallons of molasses which were used, in the main, for horse fodder. To keep the barrels cool and prevent fermentation, a shallow excavation was dug out of a small hillock known as ‘The Clump’ and the barrels were stored under a thin layer of soil….When the troops departed, the barrels were left and they remained buried until 1901 when they burst and the contents started to run down the hillside. One version is that ‘Treacle Mine’ had been excavated in Chobham by 1904. Some of the residents thought it was a redevelopment of the manufacture of gunpowder and that the miners were looking for fuller’s earth. When whole fields were used for the cultivation of lavender, it was often said “something smells round here!”. Another version is that later in the 1930s a local person discovered a spot on the Common where there was large quantities of treacle welling to the surface. Within a few days, scores of them were coming to dig deep pits, into which the treacle oozed, and could be scooped up by the bucket-full ; “…when some of the enthusiastic locals dug their pits deeper and struck something – well several somethings – in fact hundreds of giant wooden barrels of mollasis [sic]. These had been there for some years, and the wood had started to fall appart [sic] and let the contents ooze out” . Was this at the same site or a different site, or two different versions of a story with an underlying element of fact, and what effect did all this digging have on the landscape? In 1855 an Inclosure Award was made by Parliament of part of Chobham Common to Arthur George ONSLOW, 3rd Earl of Onslow (b. 25 October 1777- d. October 1870) outright, the rest comprising several thousand acres of common land was uninclosed but associated with his land. ONSLOW derived his title to the Manor of Chobham from Walter Abel who had been granted it by George II for a term of 1000 years. When ONSLOW took over the title it then comprised 2,658 acres of arable land and 1,672 acres of grassland; Chobham “Waste” or Common formed part of this lease. Previously, in 1832, the Chobham Commons Preservation Committee had been set up to protect the rights and interests of parishioners over the vast tracts of common land surrounding the village. (Leaping ahead chronologically, the Common was purchased in 1968 by Surrey County Council from the then Lord ONSLOW for £1 an acre). towards the railway at Sunningdale, the left over Gracious Pond, all marked in Wyld’s map [see below]. On Tuesday the two divisions made a fruitless attack on the guns, redoubts, and rifle-pits, and were, of course, repulsed. So far, the sole use of the manoeuvres had been to test the tactical management of troops and their marching capabilities, to test also “the Control,” and exercise infantry and cavalry in outpost work and scouting. had been strongly fortified. On the top a redoubt, formed of four walls made with sand-bags and earth walls,, protected a strong force of cannon. Around its base were cover trenches in three terraces, formed by digging out about two feet of earth, and throwing it up wall fashion in front. These cover trenches extend away behind and to the next redoubt, about four hundred yards away direct north-west, and on what may be termed the plateau of Steeples Hill, and known as Birch Mill. This redoubt was a bout forty yards square and very strongly built, with a ditch all round, and surrounded again by cover trenches for infantry. Travelling then from here in a direction nearly at right angles to the railway cutting, which is about a mile, will be found two more hills, called Oyster Shell and Ship Hill, each connected by cover trenches. These three, and the one on Steeples Hill, commanded the valley in front, that at Steeples Hill and the one below it having two faces, west and east. At about right angles to this line was one running in an easterly direction, with two more redoubts of equal strength on Long Cross Hill and Lodge Bush Hill. All these were connected by cover trenches, and round the redoubts double lines. Forty pieces of cannon were distributed over the position, giving about a battery to each, some being 16-pounders. The net-work of trenches was wonderfully arranged, and the position had the advantage of being able to move guns to either flank of centre, without being the least degree uncovered. Although the 1871 Ordnance Survey map portrays ‘redoubts’ on the hills, the map accompanying the orders shows the “Battle of Chobham Common: operations on the 19th September 1871″ ‘defences’ in general (fig 7), it is James Wyle’s plan, published in the Illustrated London News , that gives the complete picture of the fortifications (fig 8). For a very brief fictional account of the “Battle of Chobham Common” see MALLINSON’s A regimental affair. Figure 9 illustrates part of WYLD’s plan overlain on a LiDAR * image. To the northeast, the Guards Redoubt (as named on Wyld’s plan) has characteristics of an Iron Age fort (figs 10 and 11). Military earthworks derived from late 19th century OS maps; the redoubt surveyed on Hungry Hill is that on the eastern end of the ridge. His right rested on King’s Hill, and extended along the summits of a series of low eminences to Lodge Bush Hill, on the east of the road between Chobham and Long Cross. He had fortified each summit and minor summit of these eminences, and had connected the whole by a continuous shelter trench, while the front was densely studded with rifle pits. The positions of the field works were singularly commanding; the ground before them was like a natural glacis, only of double the depth of any glacis. Reckoning from his right (west) he had first, in his “Life-Guards” Battery, three 16 lb. guns; next, in his “Life Guards” Redoubt, three 12 lb. guns; next, in his Flagstaff Battery, a battery (six guns) of 12 lb. guns; next, in his “Oyster-shell” right redoubt, three guns; in his “Oyster-shell” left redoubt, the apex of his position, four guns; next, in his “Staples Hill” right redoubt, three guns; in his “Staples Hill” Sandbag Battery, two guns; in his “Staples Hill” left redoubt, three guns; in his “Lodge Bush” right battery, three guns; in his “Lodge Bush” left brigade, four guns. In all, including those of his Horse Artillery, the defender had forty-two guns against thirty-six of the invading force, six of which were detached with the Horse Artillery. After these ‘formal’ manoeuvres, military activity continued on the Common in subsequent years. In March 1876 the War Office applied to the Secretary of the [Chobham Common] Commoners’ Committee, Mr William M Medhurst, to hold Field Days for the 1st Buckinghamshire Rifle Volunteer Corps . Later that year the Secretary of War even contemplated purchasing parts of the Common for military manoeuvres . In November 1877 part of Chobham Common was purchased by “H.M.’s Principal Secretary of State for the War Department” and in the Spring of 1879 receipt from the Inclosure Commission for £150 10 6d was received in compensation for lands on Chobham Common purchased by the War Department. An advanced force had been sent from the Army Corps of the Invading Army at Aldershot, to Cowshot Manor, upon the 17th, as stated in the general idea. A battalion from this force marched in accordance with the instructions contained in special idea… at 8.15 p.m., towards Chobham. Very great care had been taken by the commanding officer to carry out the orders to reconnoitre the enemy’s camp, and to ascertain the position of his outposts. The reconnoitring officers became subsequently the scouts and guides of the column. The column first halted three-quarters of a mile south of Chobham, in consequence of a report that a vedette was posted upon the bridge, over the Hale Bourne, upon the north end of the town, the reliefs being more than a quarter of a mile behind. After some delay, this vedette, who had dismounted and was smoking, was surprised and captured by the attackers. The Cossack post to which the vedette belonged was placed at too great a distance to the rear to render assistance. The non-commissioned officers, however, sent a verbal warning to the camp of the impending attack, but the trooper lost his way. The column immediately upon this passed through Chobham, and having dropped parties to clear all approaches and also to cover the retreat, turned to the eastward and directed its march with the most complete silence and regularity upon the southeastern extremity of Chobham Common. The column reaching this point at 12.20 a.m., was brought to a halt by a signal from the scouting officer, that a vedette was in the vicinity. In a moment the whole column halted, and sank silently into the heather. The vedette nevertheless challenged, and not being answered, galloped back to his post, which eventually warned the general in command, of approaching danger. The column continued its advance, and turning northward, crossed the deep bog at Gracious Pond by a narrow path- the only possible passage. By 12.45 a.m. the column arrived 600 yards south-east of Staples Hill, and leaving the shelter of a dark fringe of trees, which had been followed for a considerable distance, it formed up in quarter column. Bugle sounds were heard in camp, and it appeared as if the enemy was on the alert. The scouting and reconnoitring officers now led the column direct towards the key of the enemy’s position. viz: Staples Hill. Which, visible against the skyline, made a very favourable objective. Silently and with great rapidity the column advanced up the hill, till, favoured by the slight haze, it closed upon the very centre of the camp and halted in front of the tents at 12.55 a.m. without any opposition. Lord Onslow had authorised the Adjutant General’s office in Aldershot to hold “…encampment and manoeuvres…” in the first week in July 1890 , although in early 1893 the Commoners’ were complaining again of the damage to the Common by exercises . It also seems likely that the Common was a popular place to hold annual summer camps under canvas for volunteer units (for example, units to which the later Royal Army Medical Corps (Volunteers) were attached). Some exercises were cancelled after permission had been given; in September 1896 a letter was sent to Lord ONSLOW saying “wet weather” meant a unit was unable to get onto the Common. To ask the Secretary of State for War whether he is aware that the 3rd Company of London Imperial Yeomanry, which is at present undergoing its annual training at Chobham, has been forbidden to manœuvre on Chobham Common; and, if so, will he state the reason for such prohibition. (Answered by Mr. Secretary Brodrick.) This company has been refused permission to manœuvre on Chobham Common, but I am not aware of the reasons for the refusal. It has, however, been granted permission to manœuvre in Windsor Park. In 1907, the War Office was raising the possibility of regularly using the Common and reflected ONSLOW’s concerns that the public might “flock” to such events and urging him to meet with General Sir Frederick STOPFORD, at that time General Officer Commanding, London District. A dispute has arisen between the Chertsey Rural District Council and the War Office with respect to the right of the former to take gravel from Chobham Common for the repair of the roads in the neighbourhood. Faint clouds of dust, through which may be seen the glistening of steel and dark masses of uniform, blur the landscape here and there, and betray the march of troops along the sandy roads, which are exactly like those worn by the tramp of men and horses through Chobham-common, and have neither fence, boundary, metal, nor drainage. The rest of the month of August was devoted to training in trench warfare, final preparations for proceeding overseas, and embarkation leave. The trench-warfare scheme was carried out by the whole division. The two opposing forces marched under war conditions until they met on Chobham Common after dark, when each side commenced to dig in with entrenching tools until the large tools were brought up. Work was continued under war conditions until 7 o’clock the next morning, when peace conditions were resumed in order to enable the work of completing the trenches to be pushed on more quickly. It was intended that the troops should occupy the trenches for some days and that reliefs should be practised, and finally a trench– to-trench attack and consolidation carried out. It happened, however, that the weather was very bad, and the scheme was abandoned on the second day. On that day the King and Queen visited the Division and walked along the trenches, speaking to many of the officers and men, and we felt that this foreshadowed a fairly imminent departure for other trenches. Immediately the trench-warfare scheme was abandoned, embarkation leave commenced, each man getting four clear days. On 24 August 1915 H.M. King George V with H.M. Queen Mary and H.R.H. Princess Mary inspected the 24th Division while working on trenches, and passed along the trenches held by the 13th Middlesex . Box Brownie photographs were also taken of entrenching activities, presumably between 23 and 26 August 1915 (see PDF for photographs) . The Bedfordshire Regiment were also on the Common:”…23 Aug 1915 – Chobham Common…Battalion carrying out Trench Warfare on CHOBHAM COMMON.”; as were 2/6th (Rifle) Battalion, “The King’s” Liverpool Regiment. The trenches can be seen in Figure 12, north of the Memorial, and in figure 13 south of Staples Hill. It is very kind of Lord Onslow to allow the 1st Bn. Royal Ulster Rifles, to use the Common. A bivouac only consists of the Company sleeting part of the night under waterproof sheet shelters. No fires need to be lit as the company will be issued that no trenches are to be dug, fires lit, or brushwood cut. It is probably desirable for sanitary reasons that some shallow pits should be dug for latrines. There will be as few as possible and will be filled in. Additional, the Common was also being used by the Army Staff College at Camberley in June 1915 for TEWTS [Tactical Exercises Without Troops] (see the account in WARNER). A letter dated August 1919 indicates that sand was being extracted by the Burrow Hill Silica Works with first a kiln then later a “drying machine”. In 1924, T M NEWELL, Engineer-in-Chief of the Mersey Docks and Harbour Board requested of Lord ONSLOW the extraction of 8-10 tons of sand by Messrs Stearn & Sons, “Heathfield”, Sunningdale for the maintenance of the channel of the Port of Liverpool. The proposal, which seems to have been accepted, was the “…removal of the sand and the filling up of the area [?Longcross Farm area?] and replacing the turf, no greater depth than 6 inches was to be removed at any one place…” over a 20ft x 20ft plot. They were prepared to pay 10s per ton for the sand. From the late 1920s the Chobham Common Preservation Committee was responsible for the management of the Common on behalf of Lord ONSLOW. I hope to elucidate, if I can, from the noble Earl opposite (the Earl of Onslow) what the real intentions of the War Office are with regard to the commons in Surrey and places near London. Your Lordships are no doubt aware that this question excites a great deal of interest and, I think I may fairly add, a great deal of apprehension, because there is a feeling that the attitude of the War Office is a little like the attitude of the wolf to Red Riding Hood. People who use and who live near these commons are rather afraid that the commons may be swallowed up and cease to be available for purposes of public recreation…. He will, no doubt, be able to give your Lordships many more concrete facts than I can give. I have endeavoured by reading what has appeared in the public Press and in particular what took place when a deputation visited the War Office, to find out exactly what it is the War Office desire to do. As I understand, it is said that this open space is required for the purposes of manœuvring, chiefly, I think I am right in saying, what is called the new mechanical Army…. [The Earl of ONSLOW: Not chiefly]…Well, partly at any rate, the new mechanical transport. In that connection a demonstration was given by the War Office which was very fully reported, the other day, in which some tanks appeared to have behaved very respectably on hard ground under observation and as a result of which, for one moment, I was afraid the noble Earl opposite (the Earl of Midleton) had been squared by the War Office; but I hope your Lordships will find to-day that that is not so. It was reported that one unfortunate incident took place. A tank was asked to pivot and I think The Times, in describing what took place, made use of the words “disastrous in its results,” by which I suppose The Times meant that the tank did completely turn up and destroy the ground round about it. I was not there, but I gather that was what was meant. First of all, no doubt the noble Earl, Lord Onslow, will tell the House why this extension of the War Office powers is necessary, why new powers and new land are necessary for their operations beyond what has sufficed in past years. Secondly, he may be able, though I doubt it, to reassure your Lordships and, what is more important in this connection, the general public as to whether in fact these commons will remain available as places of recreation. …it was ruled for me that, though the Act of 1842 was available when the War Office wanted to take sites for ordnance for the defence of the country, it was not available when the War Office wanted to take sites for manœuvring. At the beginning of the War, when the War Office seized upon this common, I went to the officer in charge on the spot and asked: “Under what Statute is this done? I am ready to give up anything to the War Office, but I should like to know under what Statute it is being done.” He said: “I admit that under the Statute we cannot do it.” But he turned over a page and said: “Under the Defence of the Realm Act anybody who obstructs the Commanding Officer may be removed from the district. Therefore I am afraid you will have a very poor time if you object.” I admit that that was a very proper course in the circumstances. From March to May squadron, battery and company training takes place, when the troops train close to barracks. June and July are the training periods for Cavalry regiments, Artillery brigades, Infantry battalions and brigades. That is the time when it would be most necessary to have a change of area, and when the commons would be most useful. In August the areas are very little used, as the troops are engaged in shooting, and there is not much training done. In September the Aldershot troops are as a rule absent in other training areas. That is the time for divisional and inter-divisional training, and they would probably be away. In winter there is no training of troops, but parties of officers and non-commissioned officers carry out tactical training without troops. …in general words that we are prepared to enter into suitable covenants to use the commons in such a manner as will not destroy their natural amenities, not to cut down trees, not to dig permanent trenches, not to erect buildings other than temporary shelters, and to give the public access to the commons when they are not being used for military purposes. It is true my father sold a small portion of Chobham Common. I wish he had sold the whole; but he did not, and at present the arrangement is that the Brigade of Guards go there and use the common. I asked my noble friend, who is not in his place at the present moment, whether he had used vehicles there, but he has not, so I cannot speak as to that. I dare say many of your Lordships are familiar with Chobham Common. Except at Queen’s Clump, there are practically no trees, and it is mostly open heather, so that, of course, the question of trees does not arise. But there is the question of fire, which was referred to by my noble friend behind me. I have several other commons round Chobham, and we have a great deal of trouble with fires, but I can safely say that, when fires do occur, it is not the fault of the troops, and I would very much rather that fires occurred on Chobham Common when the troops are there than when they are not, because they break off what they are doing and set to work to beat out the fires. It is part of the arrangement. So the enormous numbers of troops on Chobham Common—I am speaking from my own experience—are far less dangerous than the mildest-looking nurses and children, especially at tea-time. As far as fires are concerned, the troops are an advantage rather than a disadvantage. …that there must be an extended area for such [Army] training. What happens is that the Island is small and people want to use more parts of it than they did before. The alternative to utilising the commons is that we must either not train the Army—and I think nobody would suggest that—or we must utilise common land or buy agricultural land. Those are the only three alternatives, and I think the utilisation of common land is probably the least expensive. [Earl of MIDLETON: The right to buy common land? ]… The right to go on it. I do not think I ever suggested anything more than that right. It is very kind of Lord ONSLOW to allow the 1st Bn. Royal Ulster Rifles, to use the Common [ 16/17 May 1929]. A bivouac only consists of the Company sleeting part of the night under waterproof sheet shelters. No fires need to be lit as the company will be issued that no trenches are to be dug, fires lit, or brushwood cut…It is probably desirable for sanitary reasons that some shallow pits should be dug for latrines. There will be as few as possible and will be filled in. This particular request, however, was the start of some acrimonious correspondence between the Army and Lord ONSLOW and his representatives on the military use of the Common. Initial, the idea of bivouacking caused horror from the latter prompting Maj Gen Charles CORKAN, General Officer Commanding to send a placating letter dated 28 February 1929 assuring ONSLOW etc that Standing Orders set out what was allowable on the Common (see PDF for figure 14). What had upset Lord ONSLOW was that HQ London District has themselves been given permission to other units not in London District to exercise and train on Chobham Common. ONSLOW suggested that the War Office should come to some more satisfactory arrangements. 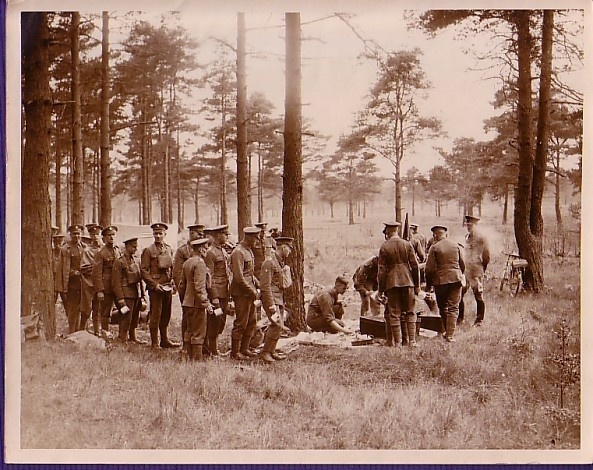 What those arrangement were is so far unknown as the Army continued using Chobham Common for training – the following shows the 1st Battalion of the Scots Guards undergoing training on the Common in 1934. In May 1936, Lord ONSLOW’s agent received a request to extract sand from the Common at the rate of 100 cubic yards per day. His advice to ONSLOW was that the Chobham Common Preservation Committee were likely to object and that there should be a delay in making a decision. Major General Commanding London District had written seeking permission for O.T.C. contingent of Imperial Service College and Beaumont College to hold tactical exercises on Chobham Common on the 12th November and to use blank ammunition during the exercise. This was granted. On 9 August 1937 it was reported that there had been”…Damage to the Common by the Bat. of the Coldstreams. The Chairman had been visited by Major Sands, the Compensation Officer of the Aldershot Command” . In December 1938 it was agreed to repair “…damage done by military to trenches etc” . Also by the 1938 it is recorded that there was much correspondence between Lord ONSLOW and the Army over the Army’s use of the Common “…for training purposes [and] the digging of defensive ditches…”. In their report for 1937, Chobham Common Preservation Committee noted that Scotch Pines [sic] had been planted at the northern end of Oystershell Hill in celebration of King George VI; permission had been given tio various schiolls to have field days on the Common; and that the “…Fish Pond (Dunstall Green)…” had been cleared of 40+ years of silting. The Secretary reported that he had received a new agreement between Lord Onslow and the War Office from June 1939 for ten years. Mr. Acworth also referred the damage which was being caused by army lorries to the ditches which had been cut for the protection of the Common. Mr. Acworth had written complaining to the O.C. Pirbright and had suggested that parties should be sent at regular intervals to repair said damage. Sir Edward Le Marchant thought it would be better to get the War Office to send down their Compensation Officer to assess the damage. …My husband lived in Brick Hill all during the last war. He well remembers the POW camp and then the “Squatters”. Prior to it being a pow camp, serving soldiers, mainly Canadians, were stationed there. The local women would do their washing in exchange for sweets, cigarettes and money. Many left one night never to come back they were killed during the D day landings…. My Dad was in a Panzer regiment and ended up at the Chobham camp by way of repatriation. He was on a train from Liverpool bound for Hull to be put on a ship home. The Russians started doing their thing and the train was diverted to Kempton race course. From there he went to the Chobham camp. Like lots of other POWs (there were Italians as well as Germans) they worked at Hillings along the Bagshot road. …or Italians – although camps at Ascot and Old Dean seem to have been sites for possible PoW camps for this nationality . The widely held belief in the Museum is that (a) they were targeting Sunningdale station, and/or (b) they were dropped during the Battle of Britain (July-October 1940) . Raids were extensive during the period; reporting in Woking started on 23 August 1940 on a bomb dropped at 0255 on Horsell Common – substantial reporting continued on a monthly basis, with bombs dropping for example, on Brooklands, Byfleet as well as extensive parts of Woking . Raids were reported, for example, between 1635-1730 and from 2000hrs on 9 September 1940, including bombs at 2225hrs on Sutton Green Common and at 2350hrs on Horsell Moor ; daylight raids were recorded between 1545 and 1645hrs, and later 2020-0530hrs on 11 September 1940 . There is a theory that the bombers were targeting the locally known ‘Tank Factory’ but that did not move to Longcross until 1942. It should also be noted that Heinkel He 111-3 (3322) of 6/KG26 (Luftwaffe) crashed on the recreation ground of West End on 24 September 1940; is there a connection with the bomb craters? In 1942 the Department of Tank Design * at Farnborough spawned the Fighting Vehicles Proving Establishment (FVPE), which moved in the week 22nd-29th June 1942 “…to a new purpose-built camp in Chertsey on the site of the former RAF Chobham that was convenient for testing tanks on Chobham Heath. The School of Tank Technology (STT) (part of the Military College of Science) was also housed at Chobham – its first course ran in December 1942″. The Wheeled Vehicles Experimental Establishment (WVEE) was also formed out of the DTD in that year, and moved to Chertsey in 1943. In 1946 the DTD merged with WVEE to form the Fighting Vehicle Design Department (FVDD) at Chertsey alongside the FVPE. The FVDD was renamed the Fighting Vehicle Design Establishment (FVDE) in 1948. Four years later the FVPE and FVDE merge to create the Fighting Vehicles Research and Development Establishment (FVRDE).” Tank testing at what is known locally as the “Tank Factory” went on at the Longcross site into the 2000s (under various organisational names – Military Vehicles and Engineering Establishment (MVEE); in 1984-5, the Vehicles Department of the Royal Armaments Research and Development Establishment (RARDE); RARDE was merged into the Defence Research Agency (DRA) in 1991; DRA then became a division of the Defence Evaluation and Research Agency in 1995; finally becoming part of the then partly privatised company Qinetiq in 2006 . There are references to the Common being used as a tank training school , and the Imperial War Museum has photographs of Westminster Dragoons (2nd County of London Yeomanry)’s light tanks exercising on the Common on 6 August 1940 (see figure 18)**. In early 1942 David HOGAN recalls “…’When we were training [in the Royal Armoured Corps] we were on Crusaders and it was a lovely English tank…but we went onto American tanks and we did a bit of our training on Chobham Common in Sherman tanks’…”. The visit of Canadian Tactical School to STT on 23 October 1943 included demonstration of vehicles on the common that included “…Pz.Kw.III – Model L [and] Pz.Kw.III – Model J…”. There is also evidence that the Common was used for the evaluation of captured enemy armoured vehicles. The testing of tanks over the rough terrain of the Common had the greatest impact on the Common. Figure 19 – a composite 1945 aerial photograph – and figure 20 shows the extent to which tank testing covered the Common, notably trials involving mine-clearance tanks, such as those fitted with flails (see ** above). Figure 20. Separate 1945 air photographs of Chobham Common. The failure to find a suitable site for large-scale trials by January 1945 was a serious setback for the long-term research programme of the [Mud] Committee, which had to be put in abeyance due to the imperatives of war. Instead, the Committee turned its attention to the possibility of qualitative trials involving the use of an artificial ‘soil bath’ and other sites for comparative tests. The artificial soil bath was to be established at the FPVE at Chobham and would consist of a concrete lined bath 30m long, 9m wide and 1.8m deep me (100 x 30 x 6ft) with additional ramped ends 9m (30ft) long…This facility was not built and discussions were still in progress as late as 1946…However, a natural facility was made available at Albery [sic] Bottom on Chobham Common consisting of waterlogged loam, sand and clay with an underlying bed of firm clay. Chobham Common was used for cross country trials, including a most unpleasant “basin” of thick liquid mud and gravel through which tanks were driven slowly to test durability of things like bearings and oil seals. I recall driving a Valentine (Infantry Mark III tank, 17 tons) with a sharply raked-back front armour plate through this hazard, and watching apprehensively the evil smelling gunge lapping closer and closer to the open port in front of my face before the tank hauled itself out onto firm ground again. 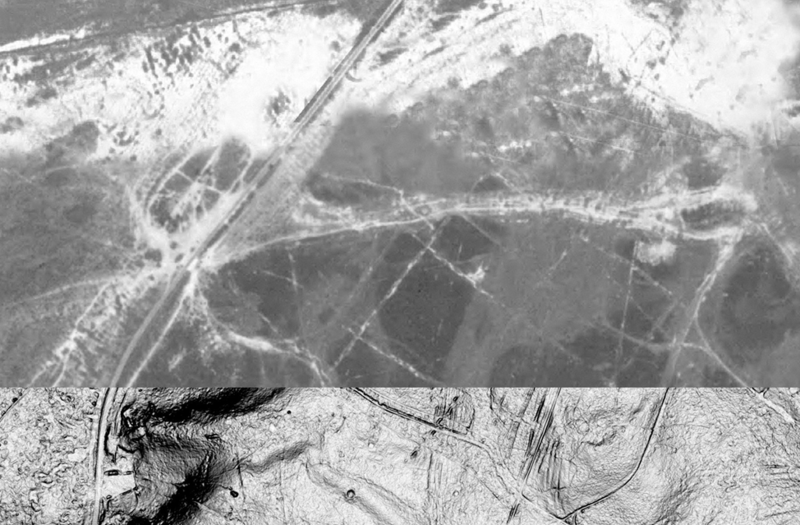 Some of the tracks from these tests can be seen on a 1948 air photograph (fig 21). Later, such testing took place over a specially constructed track within the confines of the MOD estate. The Common was also used for special testing. Surrey’s HER records the existence of a ‘tank hide’ – see Appendix 1 – although William SUTTIE believes that “…in light of the large amount of testing and the need to drive to the hide I would not think it was dug for the specific purpose of hiding vehicles. More likely it was dug as part of tests of a tank with a dozer blade to see how long it took to dig what is a commonly used defensive position for tank” . So what can be seen of these features today? From the 1853 Great Camp, the most obvious is the redoubt near Victoria’s Memorial. Second World War bomb craters are still visible. Other earthworks created for the 1871 Autumn Manoeuvres around Oystershell Hill are recorded on Surrey’ Historical Environment Record (HER) – Appendix 1 – although evidence on the ground is dubious! There is some evidence (albeit brief) that the Bee Garden below Staples Hill is military in nature . As for the other lumps and bumps…and the unexplained?  Description: Long Arm. At the west end, on the sheltered northwest aspect, is a house platform and associated features linked by walling with some evidence of cultivation. There is disturbed ground with a mound evidently the result of earth-moving to east. Possibly a farmstead. A subsequent site visit in 2002 failed to locate this earthwork and therefore could not verify whether there is an archaeological feature at this site or not. Long Arm is the channel running left to right (which is north to south) in this image.  Description: A series of linear terraces or banks can be seen following around the west side of a hill overlooking Long Arm valley. On top of the hill is a flattened area, with a remnant mound on the east side. The latter is either a spoil mound or a surviving remnant of the original hilltop, it being dug away elsewhere. Local tradition ascribes it as a tank hide, which is another possibility. The linear lines around the west side of the hill have the appearance of linear ridges formed by quarrying on other commons in West Surrey (Ockham, Wisley, Puttenham). The only difference here being they cut into the side of the hill, giving them an unusual appearance that could be superficially mistaken for plough lynchets (which they are not). It is not impossible that they might be some sort of military trenching system built to defend the west side of the hill during army training in the 19th or 20th centuries.  Description: A short linear earthwork being an open ended hollow, with banks around the other three sides. The entrance to the linear hollow is on the north or east side (bearings were uncertain). The hollow itself is about 4m wide and about 20m in length. It is uncertain if it has been excavated into a hillside or if one side has been thrown up artificially to create a position where tanks could be hidden. Local tradition ascribes this feature as a tank hide. The dimensions and locations make this plausible.  Description: OS 6 map of 1870 shows an earthwork enclosure here marked Battery (For Military Practice). Possibly erected during the Great Army Encampment of 1853. Site of sub-circular military battery, similar in shape and form to that on site of the Memorial Cross, which this one faces across Long Arm. The fact that they can be seen from each other across a prominent valley suggests they are contemporary. The earthworks were not seen when visited in January 2002 as the site was overgrown by gorse and the author was then not aware of its possible presence. It is shown on the 1871 OS 6″ plan (sheet 10), where it is marked as ‘Battery For Military Practice. It is shown again in 1898, but not on maps thereafter. Maps show sub-circular enclosure about 25m across, possibly surrounded by ditch.  Description: North of Oystershell Hill, the local summit of the plateau on this side of the M3 features a possible circular enclosure, diameter 60 metres. On northwest-north there is evidence of a bank 6 to 8 metres spread, which at its highest appears as a mutilated mound about 1.5 metres high from the outside. Gorse and scrub obscures much of the site, but these is little more to indicate the inside perimeter of an enclosure. However the outer perimeter is very distinct on the north, east and south. Only on the southwest and west is it indefinite and confused. The interior rises slightly and has been dug and pitted.  Description: A plan of an earthwork enclosure drawn at a scale of 25 inches to 1 mile, by Mr Edward Andrew Downman of Laindon, Essex between 1889 and 1905. Now in Kingston Museum ref. S(913) no.3666.  Description: Observation of remains of a small enclosure opening onto a hollow at the west end, situated at an angle on the plateau of Oystershell Hill, on a sub-rectangular low rise.